There are 2 effects here that are related to one another. And they are both available from the same supplier. One of them is called “Jewel Box Prediction” and the other is known as “Prediction Dice”. We shall discuss the Jewel Box Prediction first. This is a polished wooden box measuring 5” long X 3.5” wide X 2.5” high when closed. Inside the box are 6 compartments. Each compartment contains a different coloured precious gem stones. They are: ruby (red colour), diamond (white colour), yellow sapphire (yellow colour), blue sapphire (blue colour), emerald (green colour) and amethyst (purple colour). There is a sliding drawer near the bottom of the box. The entire prop looks interesting and rather mysterious. Here is the basic effect. The lid is lifted up to show the 6 colour jewels. A spectator chooses one by taking the gem stone out of the box. Let us assume she chooses the ruby (red colour stone). At this point, the performer can say something about the properties of ruby that was chosen and what this gem stone means to the spectator. The jewel is replaced back into the box. The performer says he already knows, from the personality of the spectator, that she will choose that particular gem stone. To prove this, the performer slides out the drawer and it contains a miniaturised red ruby stone. Prediction Dice has a similar effect. Instead of the 6 gem stones, the box contains 6 dice, each with a different number side facing upwards. The prediction in the drawer is a chip with the selected number printed on it. You receive the appropriate box (that contains the jewels or the dice), and a sheet of written instructions. You will be able to perform the effect immediately after reading the instructions. The effect is easy to perform and there is no angle problem. There are no moves and it can be performed surrounded. The reset is also very fast. The secret is self-contained in the box. The actions carried out by the spectator actually operates the effect. This clever idea belongs to T.A.Waters. It was mentioned in his monumental book called “Mind, Myth & Magick”. It is the first effect desribed in the book and it appears on page 5. The effect is called “Box Office”. In this case, the box contains 12 different amulets instead of the 6 gem stones or dice. The prediction is a folded piece of paper. You can also adopt this method of revelation instead of the chip and miniaturised gem stone once you understand how the effect works. If you like mentalism with colourful props, you will love the Jewel Box Prediction or Prediction Dice. After the effect, the 6 gem stones or the 6 dice can be used in other magical effects. A semi-transparent card, the same size as a playing card, is shown to a spectator. She holds onto this card while the performer takes a picture of her using her own mobile phone. The performer introduces a deck of card and the spectator selects one. The card is then returned and lost in the deck. The spectator holds the semi-transparent card in-between her 2 palms. The performer claims to transfer the identity of her chosen card onto the semi-transparent card, but he fails. The semi-transparent card held by the spectator remains the same. The performer then realises that her card has transformed into the identity of her chosen card about 2 minutes ago. To prove this, the spectator looks at the photograph taken by the performer on her mobile phone. It indeed has her holding the semi-transparent card that now has the identity of her chosen card imprinted on it. The spectator can now take pictures of the semi-transparent card and nothing will show on it in the photograph. This special magical moment is captured in her personal cell phone as a souvenir of having seen the performer’s magical power! She can post this in her social media for all her friends to see. A great promotion for the performer. It is a novel way of revealing a chosen card. It uses the latest technology – a cell phone. It uses the spectator’s phone, a borrowed phone – therefore, it does not depend on any app. You receive 3 special semi-transparent cards. 2 are gimmicked to reveal the “Ace of Clubs” and the “Seven of Hearts” respectively. One is non-gimmicked for you to switch with the gimmicked ones. You are also given a link and password to access a video instruction from the internet. 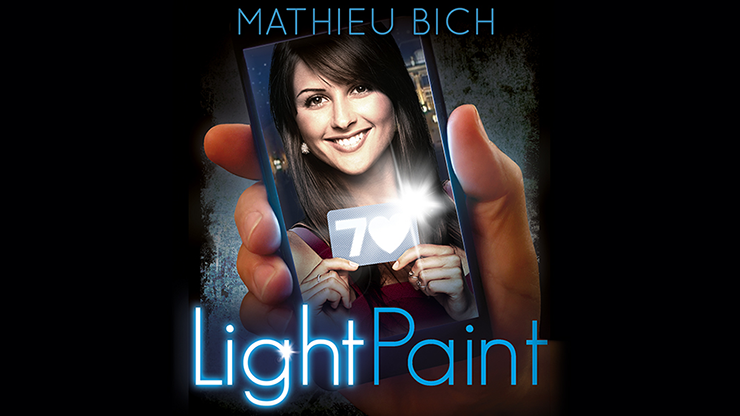 The video features the creator Mathieu Bich. The revelation depends on the lighting of the environment – you need to experiment with different ambient lightings to determine how far away from the spectator you need to take the photograph. The special ink can be rubbed away. Mathieu teaches you how to properly maintain the cards so that they will last a long time. How to adhere the special card to a reward type card so as not to make it looks like a magician’s card. How to reveal not one but 2 selected cards, so that the effect becomes like a routine. You may want to know that prior to releasing LightPaint, Mathieu has used this principle to create an effect known as “Ghost Camera” for the Japanese magic company Tenyo. In this product, a handkerchief, instead of a special semi-transparent card is used for the revelation, using a borrowed cell phone. Sven Lee’s Svenlopes have now become a classic resource for mentalism. If you do not already know, they are a stack of envelopes specially manufactured using the Svengali principle to force an item. In this effect, the Svenlopes are used with a set of movies posters. A spectator freely cuts a stack of 24 envelopes, inside each envelope is a different miniature movie poster. The cut-to envelope is set aside. Both the bottom and the upper envelopes of the cut-to envelope are opened to reveal a different movie poster each. In other words, had to spectator cut the stack of envelopes one too few or one too many, she would have arrived at a different movie poster. Inside the cut-to envelope is, say, the Titanic movie poster. This movie is predicted in advance by a prediction inside a prediction envelope placed to one side at the start of the effect. The spectator is then asked to turn over the Titanic poster and silently choose one of the actors of the movie printed on the back of the poster. The performer is able to divine the selected actor letter by letter. You receive a total of 24 black 4 X 6 inches Svenlopes, one spare Svenlope, one prediction envelope, 6 poker sized multi-coloured envelopes, and 38 miniature movie posters. The colourful movie posters are very well printed on glossy stiff art paper. Included is also a tough clear plastic transportation container. The movie posters are only 3 X 4 inches. Each of them is to be put inside a 4 X 6 inches Svenlope. A larger sized poser of 3 X 5 inches would make a better fit for the Svenlopes. The stack of black Svenlopes is an utility item. You can download a pdf of 126 pages that gives 22 routines for use with these envelopes and an additional 10 routines for the 6 multi-coloured envelopes. There are 2 other pdfs that can also be downloaded. One is a 30-page pdf that gives you the detailed handlings of the Svenlopes. 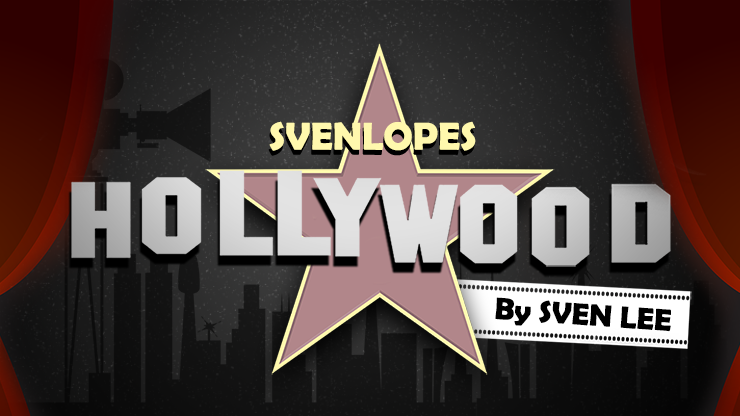 The other is a 17-page pdf instructions showing you how to perform Svenlopes Hollywood. Magicians like the fantastic effects that a memorised deck can offer. But many of them dread learning it because there is no logical system or structure to help them to remember the stack. They remain contended with the Si Stabbins or “8 Kings” stack. Yet they do not mind spending hours and months perfecting a certain sleight or move. To them, memorising a deck of cards is not only difficult, but also extremely boring. 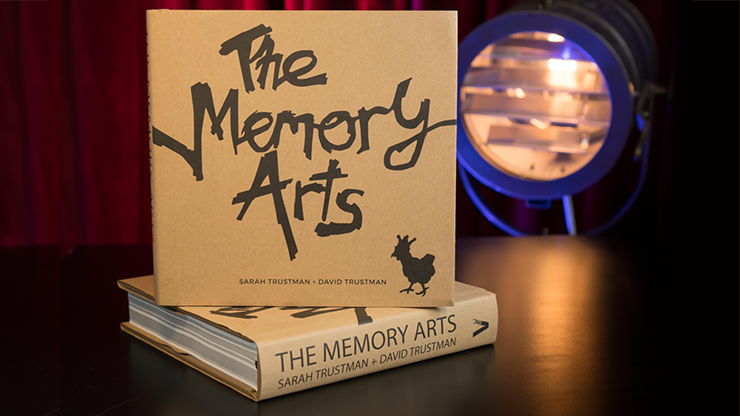 To these magicians, Sarah and David Trustman’s book “The Memory Arts”, is their perfect solution. This is a book that teaches you how to store vast amounts of information with the minimal of effort, and specifically, how to memorise the Arason’s as well as the Tamariz’s deck stacks. The book itself is attractive in every way. It has an unusual square shape, measuring 7.5 X 7.5 inches, and contains 341 pages. It is a hard cover book and has an artistically designed brown dust jacket. Most of the pages are printed in full colours and contains beautiful drawings by David Trustman himself. There is a black ribbon that attaches to the book and serves as a bookmark. The book will sit proudly in any book-shelf. The tome starts with a historical introduction to the world of mnemonics. It then describes the benefits of having a good memeory, including that of combating Alzheimer’s disease and dementia. The brain stores information best as images. The more weird and absurd and interesting the visuals, as versus those that are mundane and boring, the better our minds can retain them. We also need a structure known as the Memory Palace in our minds to house myraids of information. This also serves as a prompt or trigger so that we can easily recall and get the information we need. Based on this principle, the authors show us how to link stunning visuals to each of 26 locations in our Magic Palace in our minds. The next chapter shows us how to associate images to each of the 13 values of a playing card as well as to each of the 4 suits. If we attach 2 playing cards to each of the 26 locations, we can then recall the identity of any card at any one of the 52 positions in a deck of cards. This is done by creating a fantasy story for each of the 52 playing cards at each of the 26 locations. The authors then straight-away show us how to memorise the Aronson stack as well as the Tamariz’s Mnemonica stack. In the next section of the book, they teach us how to remember locations 27 to 52. If we again attach 2 cards to each of these locations, we can memorise 2 different memorised stacks and recall any of them at any of the 1 to 52 locations! This is powerful and useful. You can now easily memorise not one but both the Aronson as well as the Tamariz stacks and recall any or both of them! “The Feinaiglian Grid”, with a slight modification, provides another method of organising and recalling 52 different items. There is an effect by Corinda called “The Amazing Memory Test”. Inspired by this, the authors describe an effect called “The List Game”. The performer draws up a list consisting of numerous items randomly generated by the audience. He takes less than a minute to memorise this list and can immediately recall any item from any position in the list called for by the audience. This can be performed either as a magic effect or a feat of extraordinary memory. This system is helpful in preparing a shopping list. Names also get a treatment in the book too. An example is shown on how to remember the first 23 monarchs of England by associating images to 13 Christian names. How to erase the original images, if they are no longer required, in order to makle way for a fresh round of memorisation. How to create alternative paths when locations become overcrowded with information. The importance of mnemonics in this present age of advanced technology where information is readily available at the push of a button. This is a most wonderful book to read. You can use your own imageries once you understand the principles used in memorisation. But you will want to use the visuals in the book because they are so stunning beautiful. Once you start reading the book, it is hard to put it down. The book is useful to laymen because they can easily remember phone numbers, birthdays, appointment dates and times, shopping lists, passwords and other important codes, and also where they keep certain important items in their homes. RIP is a torn and restored card effect. What makes this different from other T & R card tricks is its straight-forward effect. In its most basic form, a card is torn into several pieces. You can hear the ripping sound as the card is being torn. The torn pieces are held together in one hand. With a flick of the hand, the torn pieces come together as a whole card. It can be shown on both sides, and can be tossed from hand to hand. With a little care, the effect can be performed surrounded. The entire effect is over within 15 seconds. There is no need to restore the card piece by piece or perform some other moves with the card. It is highly visual. You receive a well produced DVD and the very well hand-made gimmicked card that is ready for use in a performance. The great thing about RIP is that this gimmicked card can be reused and there is no need for any replacement. The reset is almost instantaneous. However, you need to practise to get the knack in performing RIP well. Properly performed, RIP is quite convincing, especially with the tearing sound. Because of its very quick effect, it is good as an opener in a card routine. If RIP is to be used in the middle of a card routine, a duplicate card has to be forced, switched to the gimmicked card, and then switch out for examination. This is all taught in the DVD. The DVD is 1 hour 20 minutes long. Christopher Wiehl also teaches you how to construct the gimmicked card from scratch, in case the present one is damaged or gets worn out through repeated use. Changed – the performer tries to locate a spectator’s chosen card, but falis, and gets the wrong one instead. He tears this card up, but it immediatelyt gets restored and transformed into the correct card. Prediction – a spectator selects one card and places it face downwards without revealing the identity. The performer claims he tries to make a prediction using another deck of cards. He has several cards in mind, but he thinks none of them is the correct prediction. He has torn all the cards up. He brings out a mess of torn pieces of cards. He discards a couple of the torn pieces. With a flick of the hand, all the other remaining torn pieces magically restore into a particular card. When the spectator’s selected card is turned over, it is seen to match exactly this card. T & R Signed Card – a selected card is signed. This gets torn up and then restored. In this case, any court card can be used as the signed selection. There is a variation in which the signed card can be shown to be actually torn before it is restored. In this case, it is recommended that you get 2 different spectators to sign the chosen card. The Magician’s Insurance Policy has become a classic effect. Many magicians shun performing this because they think it is too well known. It is “too well known” because it is an old effect. It is well-known to magicians, but it is not too well-known to laymen. It is an interesting premise for a magician to purchase an insurance policy against failing to find the correct chosen card! It is a sure laughter generator the moment the performer brings out his Magician’s Insurance Policy. The audience has not seen or heard about such an insurance scheme for magicians. 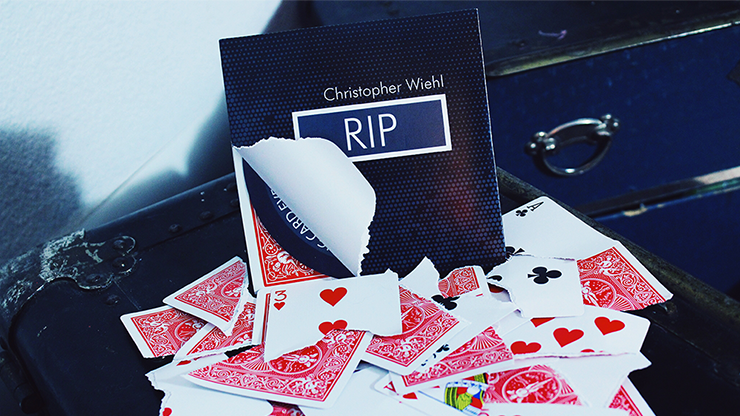 Here is the actual effect: the performer explains that he is about to perform the world’s most difficult card trick. Therefore he has purchased a Magician’s Insurance Policy to guard him against failing to find the selected card. He brings out the Policy and places it on the table. He has a card chosen and then lose it back into the deck. He claims he can cut to the chosen card. He cuts the deck but the card cut at turns out to be the wrong selected card. He asks to have another chance. He fails again on the second trial. It is time to turn to his Insurance Policy. He opens the policy and reads out the 8 conditions of the policy. They all contain comical terms. The last and 8th condition refers to enacting the “big finish”. The performer unfolds the policy and reveals a giant sized image of the chosen card! You receive 2 policies in 2 sizes: one for parlour or stage performance and the other for close-up show. When opened fully, the stage sized policy reveals a giant-sized King of Hearts measuring 18” X 24”. When folded, the policy measures 4” X 9”. The close-up policy reveals a 7” X 9” Queen of Diamonds, and folds down to a 1.5” X 3.5” document. Both policies are well designed and produced in thick paper that will last through dozens of performances. Since you receive 2 policies with different reveals, you can actually use either one for repeat performance. The close-up policy is small when folded (1.5” X 3.5”), but it is large enough for parlour performance when it is opened to a 7” X 9” Queen of Diamonds reveal. The parlour sized policy can be used for close-up. With the final reveal of a 18” X 24” King of Hearts, it is quite large for close-up performance, but this large reveal gives you the comical element especially when it is used as a climax to the close-up performance. There are various ways of presenting the effect too. Instead of bringing out the policy at the beginning of the effect, take it out only when you apparently “fail” to find the chosen card. If you have not owned a Magician’s Insurance Policy, and hesitate to purchase one, I trust this will encourage you to buy this effect and perform it. You will not regret it.